Despite my… syndicating differences with Interfacelift I still regard them as primary source of high quality wallpapers. On other hand most of those are photographic and heavy on details. 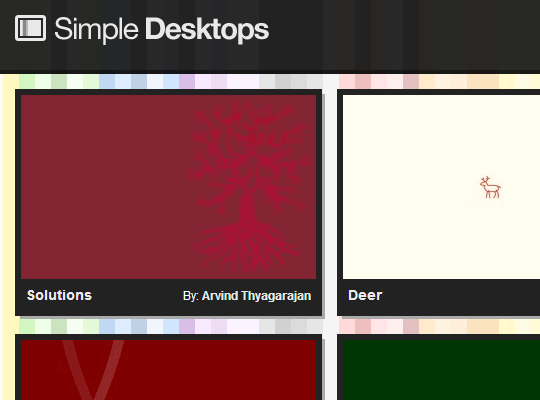 Amit Agarwal had posted yesterday about Simple Desktops which offers wallpapers of just as high quality but simple and minimalistic in content. Site is ongoing collection of wallpapers that strive to escape excessive eye-candy, but remain pleasant and interesting. All wallpapers come from submissions, site itself merely hosts them. These rules effectively subdue explosive graphics in favor of those that are clear and simple. Can’t say I love every wallpaper on site, some will only tick if interests match, others play with color schemes that border unpleasant for my taste. Still concept is great, there are enough to choose from and new ones are getting added. Sorry, Rarst, but I found them adolescent to insipid. Nothing to be sorry about, this style is clearly very niche. Still objectively quality is good and good wallpapers are hard to come by. “style is clearly very niche. dried-out hard cookies inside ! Here’s another nice site, not quite as minimal, but good. Thanks for suggestion! I took a quick look and quality seems more than impressive. Will browse it properly tomorrow.